Thousands of supporters of Ivory Coast's disputed President Laurent Gbagbo have gathered at an army base to enlist, amid fears the crisis could destabilise West Africa. The young activists were heeding a call to join the army from a key ally of Mr Gbagbo, Charles Ble Goude. He urged them to fight supporters of Alassane Ouattara, widely recognised as the winner of last year's elections. Forces loyal to Mr Ouattara have gained more territory in the west. The New Forces ex-rebels have taken the town of Blolequin, residents say - the fifth they have seized in recent weeks. The fighting has led some 90,000 people to cross into neighbouring Liberia, the UN refugee agency says. UNHCR head Antonio Guterres said the conflict could affect countries across West Africa. "The risks of destabilising the region are enormous," he told the BBC's Network Africa programme. He pointed out that Liberia was a poor country recovering from its own civil war and said hundreds of other refugees had also crossed into Ghana. Ivory Coast, the world's largest cocoa producer, used to enjoy the highest living standards in West Africa. The November election was supposed to reunite it after a 2002-3 civil war but Mr Gbagbo refuses to cede power. On Saturday Mr Goude, appointed as Mr Gbagbo's youth minister, urged his supporters to join the army and "liberate" the country - the New Forces still control northern areas. 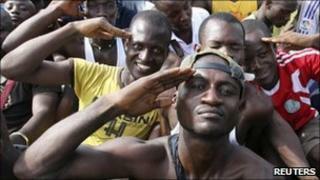 Prospective recruits turned up an army base in the main city, Abidjan, chanting slogans such as "the rebels will die". The BBC's John James in the city says the crowd pushed at the gates of military headquarters as soldiers struggled to keep order. The current Ivorian armed forces number about 50,000, our reporter says. But sources within the army have told the BBC there is widespread absenteeism from those reluctant to fight Mr Ouattara, recognised by most of the world as the rightful president-elect. Mr Ouattara is still under blockade at a hotel in Abidjan, but our reporter says his forces have been strengthened by defections from the state army, as well as a new force called the "Invisible Commandos" which has taken control of a large part of northern Abidjan. Mr Goude's Young Patriots militia has set up road blocks around Abidjan in recent weeks. He is under UN sanctions for previously inciting violence - charges he denies. Our reporter says the increasing number of armed youths in the city has led some 400,000 people to flee Abidjan. Pro-Gbagbo security forces and pro-Ouattara militias have clashed on several occasions and both sides have been accused of atrocities. Last week, the UN mission in Ivory Coast said the shelling of a market in a pro-Ouattara district of Abidjan by pro-Gbagbo forces could constitute a crime against humanity. Mr Gbagbo's allies have denied firing the shells, which killed at least 25 people. The UN says more than 435 people have been killed since the November election. The UN helped organise the election and says that Mr Ouattara won - a position endorsed by the African Union, which has said Mr Gbagbo should stand down by 24 March. But Mr Gbagbo says there was widespread fraud in areas under New Forces control and he was the rightful winner.